Harare magistrate Mr Lazini Ncube yesterday abided by a High Court ruling when he abandoned the matter in which businessman Mr Wicknell Chivayo was facing $5,6 million fraud charges. The fraud charges emanated from a botched Zimbabwe Power Company (ZPC) solar project. 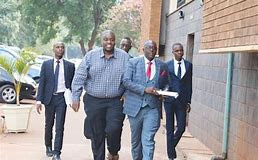 Mr Chivayo had approached the higher court challenging the magistrates’ court decision to dismiss his application excepting to the charges on the grounds that they did not disclose an offence. The High Court then acquitted him. Mr Lazini said the High Court decision was self-explanatory. High Court judge Justice Owen Tagu last week granted Mr Chivayo his application for exception to the fraud charges, a judgment that meant trial could not continue at the magistrates’ courts. Mr Chivayo was represented by his lawyer Advocate Sylvester Hashiti, while Mr Clement Chimbari represented the State in yesterday’s proceedings at the Harare Magistrates’ Court.